I went to Cheesecake Factory the other day for dinner. It's so overwhelming, the number of cheesecake flavors they have there. Some of the flavor combinations sound not so good but some of them tempt me but in the end, I always get the vanilla bean cheesecake. 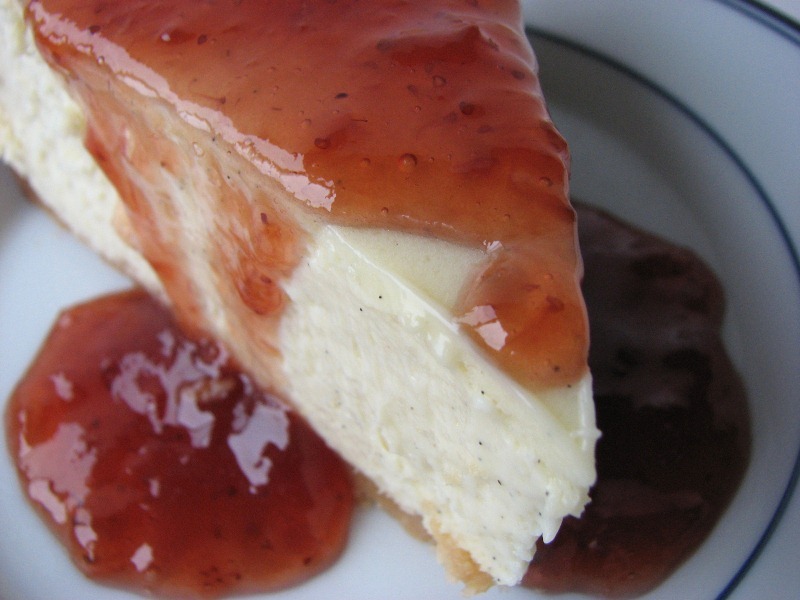 I do like to have some sort of berry sauce on my plain cheesecake but that's it. I found this recipe for plain cheesecake on allrecipes.com but did not follow the recipe exactly. Their recipe did not call for any vanilla flavoring. I added about 2 teaspoons vanilla extract AND the seeds scraped from 2 vanilla beans. Their crust is a classic graham cracker crust. I used shortbread girlscout cookies for my crust. That was a good choice! I was somewhat worried about the number of eggs in this recipe - 5 whole eggs & 2 egg yolks. I thought that amount of eggs would result in a more custardy texture or too eggy of a flavor, but it didn't. 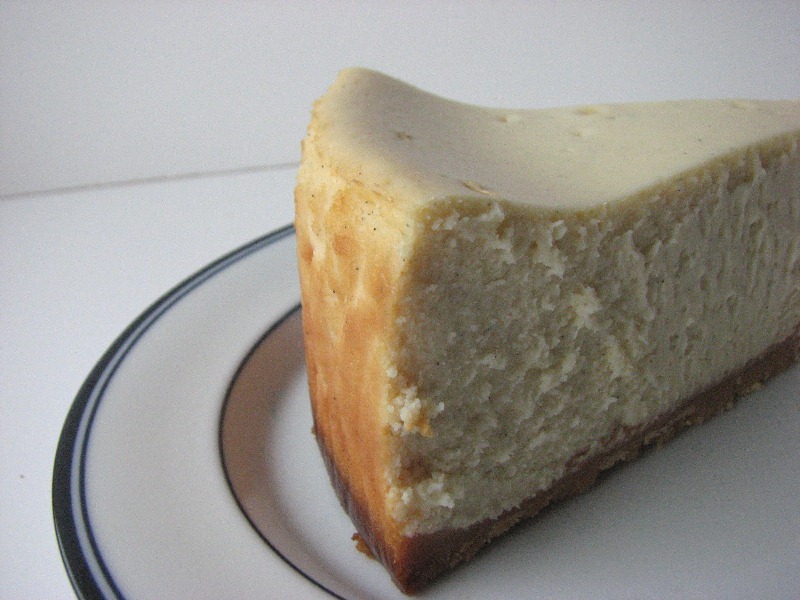 The texture of this cheesecake is smooth, very smooth indeed. The vanilla was a wonderful addition and I can't imagine this cheesecake without it. One of the main reasons I chose this cheesecake is because it's one of the only ones I could find that didn't include sour cream, which I happen to be out of. I would definitely make this recipe again. 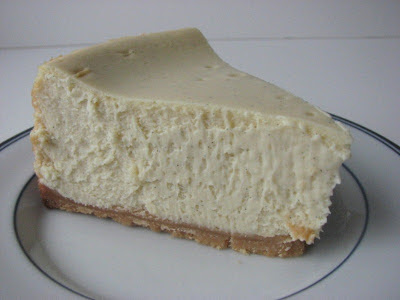 Oh, another thing that I did differently than the recipe, my cheesecake was in the oven for about 2.5 hours, maybe more. It took a LOT longer to bake then the recipe states. The last time I made a cheesecake, I used a parchment collar & I don't think I will make another cheesecake without it. I've always had an issue with my crumb crusts tasting a bit metallic like and that's even after using a few different springform pans. Also, I've had trouble unmolding the cheesecakes sometimes in the past. The advantages of a parchment collar is, no metallic taste to my crust, the springform pan slides off effortlessly and if there is a bit too much batter for the pan, the collar will hold it in. I guess I didn't perfectly smooth out the parchment this time which is why the sides of my cheesecake have sort of a wavy texture. 2. Mix the graham cracker crumbs, 1/2 cup of the white sugar, and the melted butter together. Press mixture into the bottom of one 9 or 10 inch springform pan. 3. In a large bowl, combine cream cheese, eggs and egg yolks; mix until smooth. Add the remaining 1 3/4 cups white sugar, the flour and the heavy cream (add vanilla extract & vanilla bean seeds). Blend until smooth. Pour batter into prepared pan. 4. Bake at 400 degrees F (200 degrees C) for 10 minutes, then turn oven temperature down to 200 degrees F (100 degrees C) and continue baking for 1 hour, or until filling is set. Let cheesecake cool, then refrigerate.